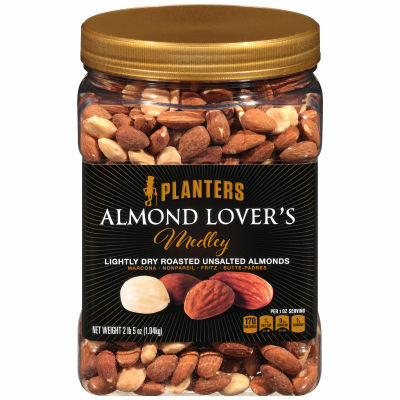 Planters Almond Lover's Medley - Curated especially for almond lovers everywhere, this harmonious blend of 4 different almond varieties is salt-free and ready to enjoy. All of the almonds are exquisitely roasted to bring out their delicate flavor. - Lightly Dry Roasted Unsalted Almonds - A tasty medley of natural Marcona, Nonpareil, Fritz and Butte-padres almonds is lightly dry roasted and packed in a re-sealable jar so you can enjoy them at any time. They're the perfect snack for everybody including those people with salt-reduced diets. Serving size 1 oz (28g) (About 31 pieces).